Hibernian manager Neil Lennon expects to be up against a familiar face in a "tough" Europa League qualifying draw. The Easter Road side will face either Brondby or Valur Reykjavik in the second round, with Hibs at home for the first leg on 14 July. Lennon anticipates facing the Danes and that will mean a reunion with striker Teemu Pukki, who played under him at Celtic. "He's a quality player, a Finnish international," said Lennon. 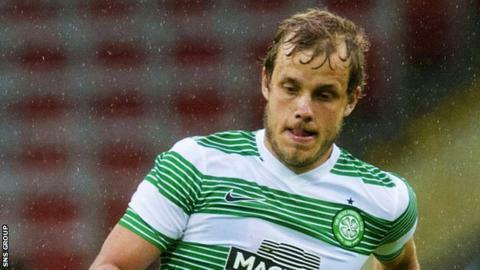 Pukki, 26, was signed by Lennon in August 2013 but the forward failed to make an impact at the Scottish champions, scoring seven goals in 33 appearances in his only full campaign in Scotland. Ronny Deila, Lennon's successor at Celtic, then allowed the forward to join Brondby on loan, despite two goals in an early season Champions League qualifier. Pukki finished as the Danish club's leading scorer and signed a three-year deal in June 2015. "It was difficult for him to settle in Glasgow but he's a talented boy," added Lennon, who was appointed Hibs boss earlier this month. Brondby, fourth in the Superliga last term, start their domestic season on the weekend after the first leg, while Valur are already eight matches into their Icelandic league campaign and sit seventh in a 12-team top flight. Hibs were humbled 9-0 on aggregate by Swedish side Malmo on their most recent European outing in 2013. "Any time you get a Scandinavian side it's fraught because these guys are up and running with their season," Lennon told BBC Scotland. "They will be that bit sharper than British teams at that time of the year. "I would expect Brondby to negotiate the tie but you just never know. "Brondby have been strong domestically for a long, long time and they've had some good forays into Europe. "I'd much prefer to be at home in the second leg but we will just have to prepare as best we can. "The priority is getting through the Championship but it's a massive bonus to have European football so we're determined to make the most of the games." Lennon, working at Euro 2016 as a BBC pundit, aims to have bolstered his squad prior to the qualifier and would like to retain last season's top-scorer Jason Cummings, who has one year left to run on his contract. "We are working away in the background trying to bring in players," Lennon added. "We're looking at one or two areas of the squad to strengthen and there are players I'd like to keep - Cummings being the main one. "I had a chat with him over the weekend and that was positive. Now we give the kid some time to go away and think about what he wants to do next. "He's only 20 and I think he has a good future. I think he would benefit from another year or two with us."